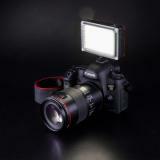 LED Light for DSLR， which has independent power switch, is compact and portable to thake it in pocket. Please don't miss it. 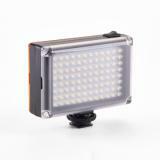 LED Light for DSLR comes with 96 LED beads that provides professional brightness in wedding recording or taking photos. 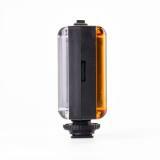 It is powered by BP-4L battery or 4 AA battery (battery not included) and attaches white and yellow filters with magnet and you could put spared one on the back battery compartment. Independent power switch can keep the same brightness out every time. LED Light for DSLR is also very easy to take in pocket and light for phone photography or DSLR camera photography. • USB port only for charging! Don't power the light directly with USB cable, or it will affect the service life of the light!! And If you'd liketo use USB , you need put the compatible BP-4L litithum battery in the light first ( can't support AA rechargeable batteries). 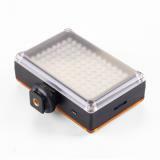 • It can work with Sony camera, but you may need to buy the mini hot shoe first separately. This is made out of plastic and is not of pro grade construction. Treat it kindly and it will serve your well. It uses AA batteries, and also some camcorder batteries. 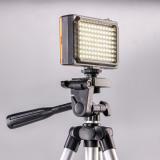 I use a high capacity rechargeable lithium ion battery I use on an old Sony camcorder and it will run this light for hours. 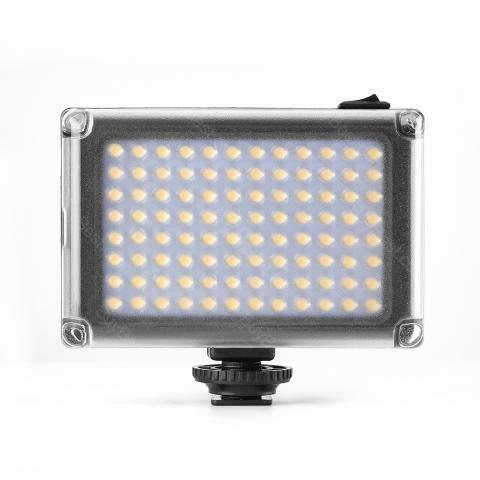 You're not going to light up a football stadium with this light, but for shooting indoors at home or similar sized spaces, or outdoors at night with subjects 15 or so feet away, this light will do the trick. When this light arrived and it came in a very cheap looking generic box and after opening it and it seemed to be made of the flimsiest plastic in China, my heart sank and "I said to myself, "You get what you pay for." HOWEVER it's really a great light. It's bright, the panasonic battery I use lasts forever --one battery lasted an entire 8 hour wedding and with a dimmer, it's versatile and fairly unobtrusive. Usually dance floors at weddings with a led look like FBI Mafia bust videos, but with the dimmer, you can get a fairly natural effect. I've even dropped it a few times and believe it or not, the plastic and wiring held up. Just make sure to use the diffuser filter as you increase brightness so as to reduce glare and harming your subject's eyes. Overall, a very nice and cheap product that surpassed my expectations. The light was much brighter than I thought it would be, so that's nice. Just make sure to use the diffuser filter as you increase brightness so as to reduce glare and harming your subject's eyes. Overall, a very nice and cheap product that surpassed my expectations. It works great with my DSLR.